If you had told me 10 years ago that dresses and trainers were 2018's ultimate combination I would never have believed it. It's the sort of look I would usually associate with 11-year-old girls—an age where you want to wear a dress but somehow practicality trumps the desire to look girly, so you pull on a pair of comfy trainers and you're good to go. But perhaps it's this feeling of childlike abandon, which has brought this unexpected outfit formula to the fore this season—the desire to embrace sartorial awkwardness (cycling shorts, anyone?) and throw the idea of traditional, grown-up sophistication out the window. After Chanel sent its models down the runway in haute couture gowns and trainers back in S/S 14, the brand got the ball rolling for a look that has continued to grow in popularity ever since. 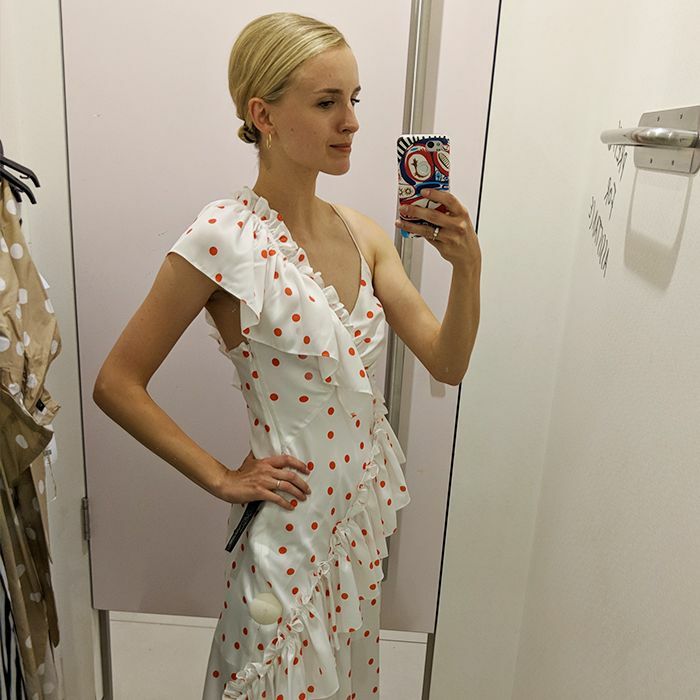 This summer, in particular, has seen dresses and trainers shoot to the mainstream, and interpretations have come in all varieties: from classic Supergas paired with a slip dress à la Monikh Dale to more punk-inspired ensembles, such as Hannah Anderson's polka-dot dress and Converse high-top look. Whatever your style, you're bound to find a pairing that you'll fall in love with. It's hard to imagine a world without this being the norm. Scroll down to discover and shop our favourite dress-and-sneaker outfits. Style Notes: Jeanette Madsen toughens up a powder-blue dress by brand-of-the-moment Ganni with a pair of Adidas trainers. Style Notes: There are some definite punk vibes in Hannah Anderson's polka-dot dress and Converse high-top outfit. Definitely a look for colour lovers. Style Notes: A pair of chunky Nike trainers perfectly grounds this frilled gingham number from ASOS. Proof that trainers can work with minis too. Stye Notes: Monikh Dale's chic ensemble is ideal for those who are slightly scared off by this season's chunky trainer trend. Superga offers the same effect but with a more understated finish. Style Notes: Pernille takes outfit clashing to the extreme with this cherubic, ruffled collar prairie dress paired with Chloé's seriously stylish Sonnie trainers. We want this whole outfit now, please. Up next: Five trends that will never go out of style in London.